As the musical version of Disney's hit film Frozen opens on Broadway, reporter Elysa Gardner takes a trip to Arendelle with some excited fans. On a late winter's evening in New York City, fans young and old gathered to be transported to an even chillier place. Their destination, technically speaking, was Times Square, where Disney's latest stage outing, an adaptation of its 2013 screen musical Frozen - the highest-grossing animated film of all time - was in previews. But even before the curtain rose inside Broadway's St James Theatre on 17 March, audience members were ready to suspend disbelief and enter the gates of Arendelle, the fictional kingdom where royal sisters Elsa and Anna grow up and apart and are then reunited - with a little help from an ice salesman, his reindeer and an indomitable snowman. "I want to see what the characters look like in real life," said nine-year-old Margaux Knepper, from suburban Long Island. Gabriel and Grace Stevens, aged 12 and nine respectively, had travelled all the way from Destin, Florida with their parents and were especially eager to see how Sven the reindeer would be recreated onstage. Credit for this goes to puppet designer Michael Curry, who previously made magic as Julie Taymor's collaborator on The Lion King, Disney's longest-running Broadway hit. Yet for all the clever design elements involved in the production, it's the performances, guided with wit and tenderness by acclaimed British director Michael Grandage, that propel the story. That story is spun by librettist Jennifer Lee, adapting her own screenplay, and composer/lyricists Kristen Anderson-Lopez and Robert Lopez - Academy Award winners both for Frozen and, more recently, Coco. The journeys of the two spirited young women at the centre of Frozen have both classical elements - Grandage has cited Shakespeare in describing the story's arc - and aspects that seem freshly topical in the #MeToo era. Elder sibling Elsa is burdened with the ability to literally freeze her environment - a power that nearly kills her sister in childhood and compels their parents to separate the once inseparable girls and isolate the castle in which they live. The parents then perish in a storm. (This is Disney after all.) No sooner has Elsa been crowned, however than her strange magic is inadvertently revealed, sending Arendelle into a state of perpetual winter and its young queen fleeing into exile. Princess Anna bravely follows her, hoping to finally connect with her sister. Meanwhile, a prince who has proposed to Anna on their first meeting organises a search party to rescue her and find Elsa. The twists that follow - on the off chance you're not already familiar with them - reference and defy sexist stereotypes. These include the myth - previously shot down in another Broadway musical, the long-popular Wicked - that strong women are more likely to compete with than support one another. As Elsa, Caissie Levy - a formidable belter whose previous Broadway roles include Wicked's Elphaba - lends heft and gleam to Frozen's signature siren call, Let It Go. She brings the same qualities to the no less turbo-charged Monster, one of several new songs Anderson-Lopez and Lopez have crafted for the show. Image caption Is love an open door for Anna (Patti Murin) and her admirer Hans (John Riddle)? Plucky Anna provides more of a comic showcase and may well prove a breakout role for Patti Murin, who is both delightfully playful in her scenes with Kristoff the iceman - charmingly played by Jelani Alladin - and poignant in a darker sequence that introduces fetching new ballad True Love. Anna is joined in the latter scene by Olaf, who is given just the right goofy sweetness by Greg Hildreth and his accompanying puppet. Revisiting a choice line from the film ("Some people are worth melting for"), Hildreth reaped a well-deserved "awwww" from Saturday's audience. Andrew Pirozzi has a more physically demanding task manipulating the more elaborate and expressive puppet designed for Sven. Yet he nonetheless gives the creature a wry soulfulness. Without speaking a word or singing a note, Pirozzi also factors in some of the show's funniest moments, nearly upstaging Olaf's entrance as he slowly manoeuvres the reindeer's bulky frame around to gawk at the snowman. Scenic and costume designer Christopher Oram, Grandage's frequent collaborator, manages the same balance of sprit and spectacle, whether summoning the cultural and spiritual traditions of local townsfolk or bringing us deep into Elsa's domain. Natasha Katz's lighting and Finn Ross's video design, meanwhile, help evoke a sparkling winter wonderland - occasionally marked by icy spikes that pop up when Elsa's anger piques. The spikes were a hit with Teegan Witock, a seven-year-old from Brooklyn, while her 10-year-old sister Anderson cited Elsa's lightning-fast costume change into a glittering ice-blue gown during Let It Go. Other audience members got a kick out of Mattea Conforti, the super-perky actress who played Anna as a young girl at Saturday night's performance. To no one's surprise, the evening ended with a standing ovation, during which Margaux Knepper and her friend Phoebe Talamas, also nine, scooted down the aisle to get a closer look at the players. They were real all right, and both girls no doubt walked back into the frosty night air feeling a little warmer inside. 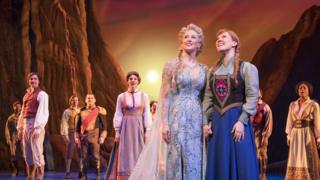 Frozen continues at New York's St James Theatre. A UK production has yet to be confirmed.